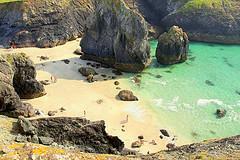 Along Devon and Cornwall’s dramatic coastline, sandy coves and smugglers’ inlets are set amid rugged scenery. The south coast is gentle with several meandering estuaries while the north is wilder and bears the full brunt of south-westerly swells. The region, which has inspired writers and artists from Daphne du Maurier to Barbara Hepworth, has become very popular, but there are plenty of secret places if you want to escape the crowds. Around Porthcurno, Penwith. For the wildest and most beautiful sands in England, seek out the atoll-island sand bars at Pedn Vounder, just east of Porthcurno, a spectacular bay with shallow lagoons. It’s a remote and wonderful place to while away the heat of the day paddling in turquoise waters (50.0440, -5.6423). Continue on for another mil or so to find several more secret beaches. Porth Chapel with fun ledges to jump from, Porthgwarra with a secret tunnel and finally the real edge Land’s End, at Nanjizal Bay (50.0536, -5.6926). Here, at low tide, you can swim through the “song of the sea” rock arch, wallow in jade-green plunge pools and snorkel into sea caves gleaming with coralline. There’s also a rope by which you can descend to giant caverns and a secret beach on the far side of the bay. Baker’s Pit, Nancledra. Open moorland spring-fed lake (once a china clay pit) with ruins of old mining works. Walk on up and over the moor to reach find Chysauster ancient village. St Nectan’s Kieve, Tintagel. At the head of a wild glen a tall, slender waterfall falls into a high basin, flows through a circular hole and drops into a plunge pool (the kieve). This is a holy place with prayer flags, a shrine room above and lots of steps. Small tea room in hermitage. Modest entrance fee.